As stars in music, acting, sports and entertainment celebrated the best in African-American music and pop culture at the 2015 @BETAwards, a large community of fans had Twitter as their sidekick to share rich commentary and reactions in real time. Periscope also transported viewers from the couch to the ceremony, with live behind-the-scenes action from the red carpet and backstage. Africa was well represented at the BET Awards by the following artists; our very own Sauti Sol, Eddy Kenzo (Uganda), MZVEE (Ghana), Sarkodie (Ghana), Stonebwoy (Ghana), Fally Ipupa (DR Congo), Cassper Nyovest (South Africa), AKA (South Africa), The Soil (South Africa), Wizkid (Nigeria) and Yemi Alade (Nigeria). 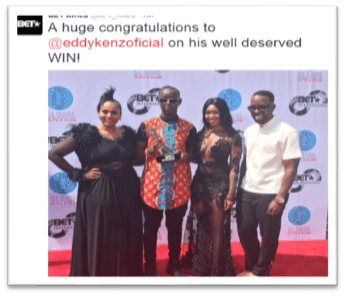 East Africans are particularly proud of Uganda’s Eddy Kenzo for winning the BET Award for Best Artist: International Viewer’s Choice Award. He is the first East African to receive this award. Fans can continue congratulating him via his Twitter handle @eddykenzoficial and follow him for updates on new song releases/ tour dates coming up. Periscope broadcasts from @BET offered fans an opportunity to join the action from the red carpet and backstage, while a Periscope robot roamed the scene to capture the moments in real-time. The stars also joined in on the BET conversation as they shared their first-hand experiences with their followers.